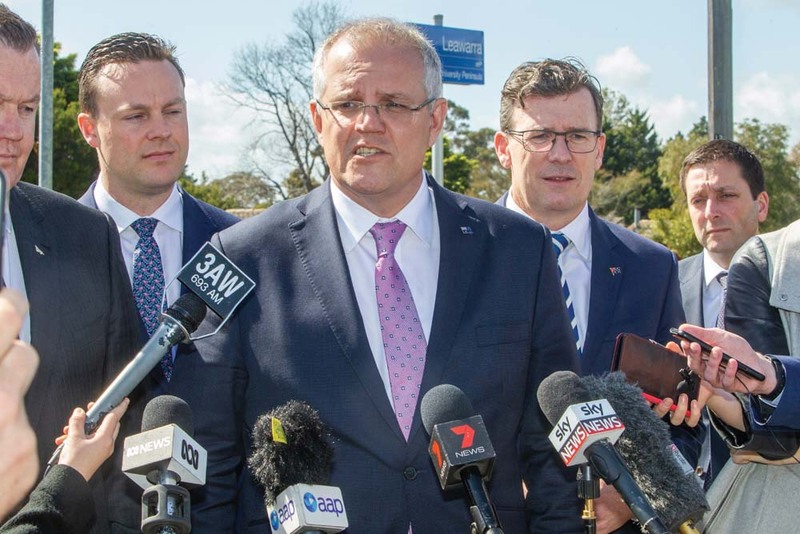 AUSTRALIA’S new Prime Minister Scott Morrison has made first visit to Frankston as leader, visiting Leawarra station to reaffirm the federal government’s $228 million commitment to electrifying the Frankston train line to Baxter. Member for Dunkley Chris Crewther MP, Minister for Cities, Urban Infrastructure and Population Alan Tudge MP, and Victorian leader of the opposition Matthew Guy MP were among the many faces on hand to support the statement. “This is a project which we announced in the budget, this is a commitment that is fair-dinkum. I’m really pleased to hear about the commitment from Matthew Guy and his team to make sure that this congestion busting infrastructure can be put in place here from Frankston to Baxter,” Mr Morrison said. “I’ll be very pleased to work with a state government that wants to get on and get things done. The Frankston-Baxter line we are 100 percent committed too. The money is in the budget which I handed down for both of these projects, and we’re keen to get on with it. Chris Crewther MP confirmed plans that stations at Frankston East and Langwarrin would be built as part of the $453 million project. The project is currently reliant on both committed funds from the federal government and pledged funds by the state Liberals. The Prime Minister confirmed that if a Liberal government were elected in November’s state election, the project would be on track for completion in 2023. Matthew Guy MP confirmed a state Liberal contribution of $225 million to the project should they win the election, and the Prime Minister called on the state Labor government to match the investment. “I don’t think there is a back up plan to the Labor party not spending money. If the Labor party want to commit to this project I welcome it, and if they don’t, you’ve got a Liberal opposition who is going to invest in it. I’d encourage people to take that option,” Mr Morrison said. The News reported on 6 August that the state Labor party was conducting a $3 million business case study to assess the feasibility of the project before committing any funds (“Labor comes to Baxter line party”, The News 6/8/18). Requests for an update on this process were not answered before publication deadline.